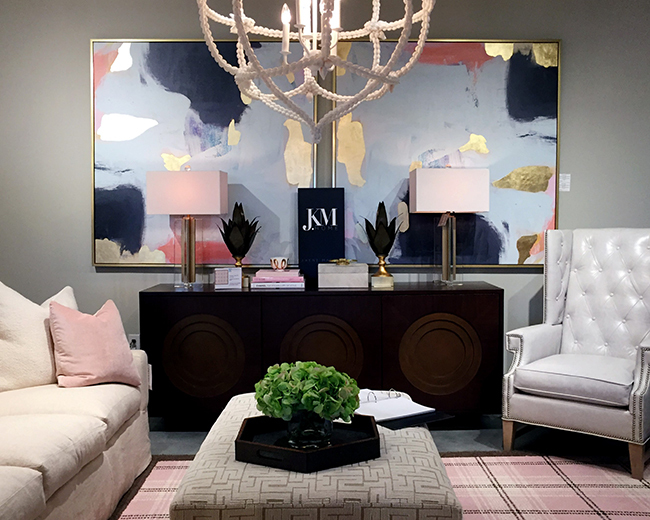 Twice a year, true interior design magic happens when the industry gathers in North Carolina for High Point Market. This massive trade show gives the design world an opportunity to show off the newest styles in furnishings, lighting and accessories. We left the event with a wellspring of inspiration after spotting these exciting new trends. Deep, dark walls painted in rich charcoal and matte black, accented by lush honey tones and cream accents, created a dramatic look. 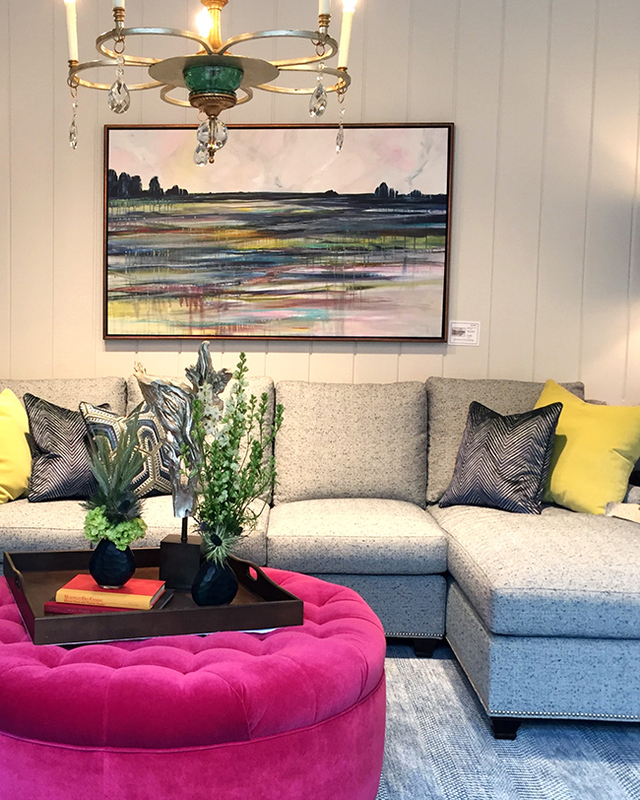 If you’re looking to make a bold statement, consider a sofa with a colorful floral print on a dark background, or even a large art piece. For a more modest look, try incorporating smaller items, like a vase or toss pillow. We always see jewel tones in design, but this season we’re seeing heavily textured pieces with vibrant gemstone coloration. Think fuchsia velvet ottomans and multitoned boucle fabric on accent chairs — even a rich emerald-green tufted couch. These intense hues can be a lot to take on, so start small with a throw blanket or chair to start. This is a great color choice for any palette, and it ties into that jewel-tone trend we mentioned earlier. Continuing the jewel-tone trend, deep teal is a shade you’ll be seeing more of. Sherwin Williams’ Oceanside, its 2018 color of the year, is a perfect representation of this hot hue. Mix metals with this color choice, and watch them sparkle. Consider painting a single statement credenza this enticing shade, and make it pop with hammered brass hardware. Or, paint your entire living room this rich color, and mix in shades of green and fuchsia. If subtle’s more your style, tone it down with cream or charcoal. The high-contrast sophisticated combination of navy blue and a soft blush pink is easy to pull off and surprisingly timeless. This soft pale-pink rug, paired with the artwork’s rich navy accents, pulls the look together, while mixed metals and cream accents finish off the aesthetic. One of the most prominent trends from the market was the use of marbling. We found chairs, pillows and art sporting this noteworthy pattern. 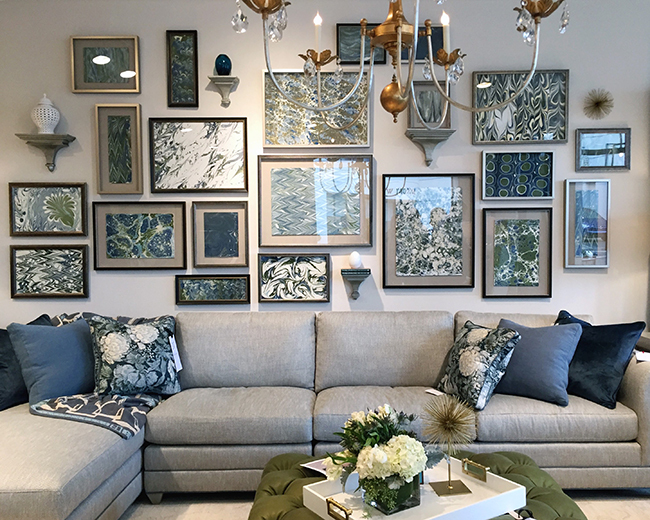 Artist Jill Seale handcrafted the art for this gallery wall — paired with a rich organic olive and soft gray blues — and it was quite a showstopper. The trend was so popular at the market that they offered classes on how to create the striking effect. Try it yourself, and build your own art collection. 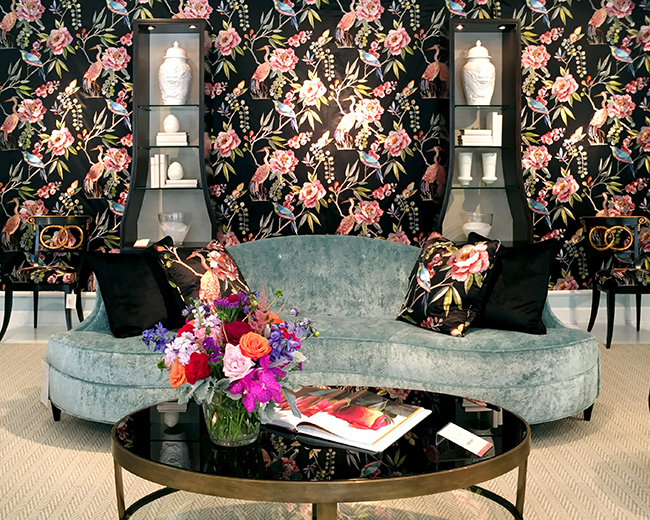 Whether you’re just refreshing your home for the season or planning a full decor makeover, let these styles from the fall 2017 High Point Market inspire you.